Me and our little one have started potty training. 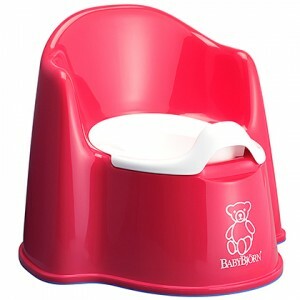 Most conventional books say potty training can only start when the baby can walk and pull up and down the trousers and put the timing at about 2-3 years of age. But our darling son just always hated wet nappies and so he started to pee whenever we changed him or put him on the changing mat. Or he cried when he wet or dirtied the nappy. First we tried holding him on the toilet and it worked sometimes, but I was worried it would be too uncomfortable for him. The old potty was just too unstable for our 9 month old. After quite some search I bought the Baby Bjoern potty brandnew from John Lewis. It was quite expensive for a potty and I doubt there are any more expensive potties out there, but it was really worth it. Our baby just loves his potty. He is so proud of himself whenever he manages to pee or poo in it. I thought it would take a while till he got to grips with it but he took to it immediately. After the second or third time trying him on it, he even pooed in it straight away. Its very common in Africa and Asia to do nappy free elimination communication, like in China [ Tribal Baby ]. Leg warmers, like BabyLegs, Huggalugs or Mikihouse are recommended to get the little ones as successfull as possible with their EC as are split crotch trousers [ DIY ]. My name is Alison and I live in the island state of Tasmania, Australia. I’ve just started potty training my 6 month old and would love to know how you are going with your little one! I find that there is nothing better than real life stories to help motivate and inspire with infant potty training, so I’d love to know more!